We’ve all seen a mom or dad serve up a sweet potato puree into their little one’s eager wide-open mouth, often complete with the special effect of a buzzing airplane spoon. It’s always fun when they’re young, but once you start baby-led weaning, mealtime looks a lot different. 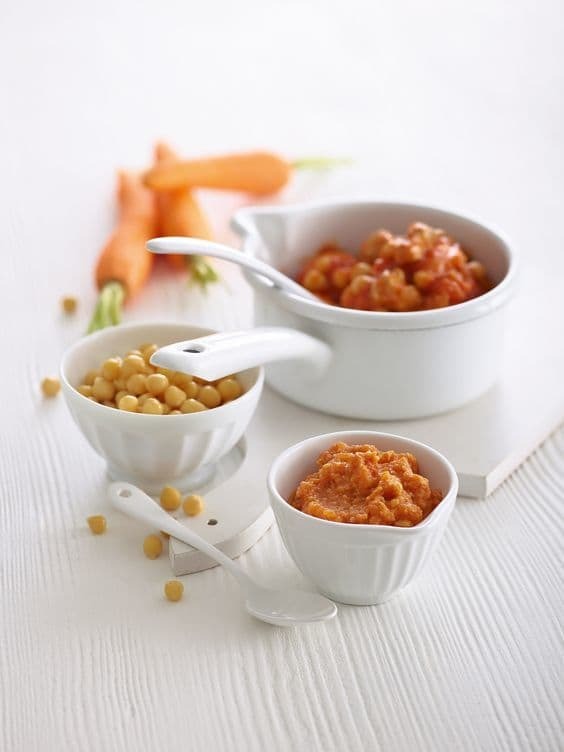 In baby-led w﻿﻿eaning, your little prince or princess sits on a high throne before a banquet of finger foods with the goal to transfer bits of food from the tray to their mouths. 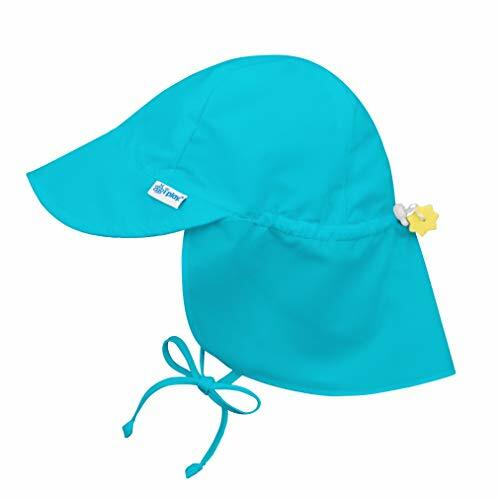 It teaches independence and gives your baby a sense of pride in choosing the foods they want to eat. 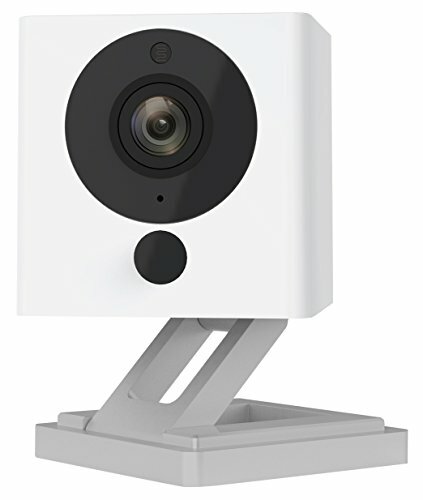 ​5. How Do You Like Your Chicken and Apple Meatballs, Hot or Cold? It is important to keep in mind when preparing all these delicious chicken dishes. Being a father of 3 and an insurance agent, you can imagine I don’t have a lot of time on my hands. So, I needed a quick, healthy meal for my princess and chicken meatballs sounded great. It’s easy to cook and only takes about 15 minutes from start to finish. You can see the appeal. Preheat the oven to 375 F. Mix all ingredients in a bowl (hands are easiest). 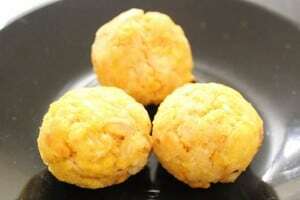 Roll into small balls (should make close to 36). Bake them for 11 minutes. I often struggled to find a super food that I could spruce up with some spices so my little girl could enjoy a tastier meal instead of that bland food she was used to. Then I came across this blend of chicken with chickpeas and apricots. In a saucepan, heat the oil and fry your onions, red pepper, ginger, apricots, and carrots for a couple of minutes. Add your chicken, ginger, garam masala for 2 minutes and then add your tomatoes, chickpeas, and stock. Bring to boil, cover, and simmer for about 20 minutes. Transfer to a food processor and blend. ​I got some MacDonald’s nuggets and fries the other day. My baby girl was more than eager to try some, but I cringed at the thought of her having some. 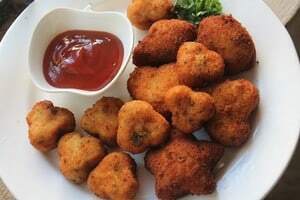 However, nuggets are easy to make, so I decided to try out a simple variation of the recipe. Mince the chicken in a blender or food processor. Transfer to a bowl and mix in spices, grated cheese, and a little bit of oil to bind it together. Form the nuggets. You can either use cookie cutters for shaped nuggets or you can shape them with your hands. 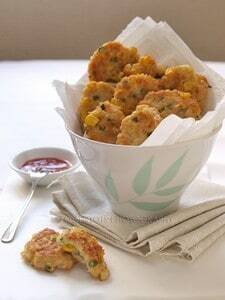 Place the breading ingredients in separate bowls, and coat the nuggets in the all-purpose flour, then the corn flour, and finally the breadcrumbs. The recipe calls for the nuggets to be fried, but if you want a healthier alternative for your little one, spray them with oil and bake in the oven. 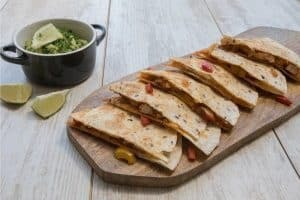 ​​I’ve always loved guacamole, and since avocado is one of the main ingredients of this dish, I thought I would give my little girl a taste of this delicious and highly nutritious super food combined with some lean chicken. 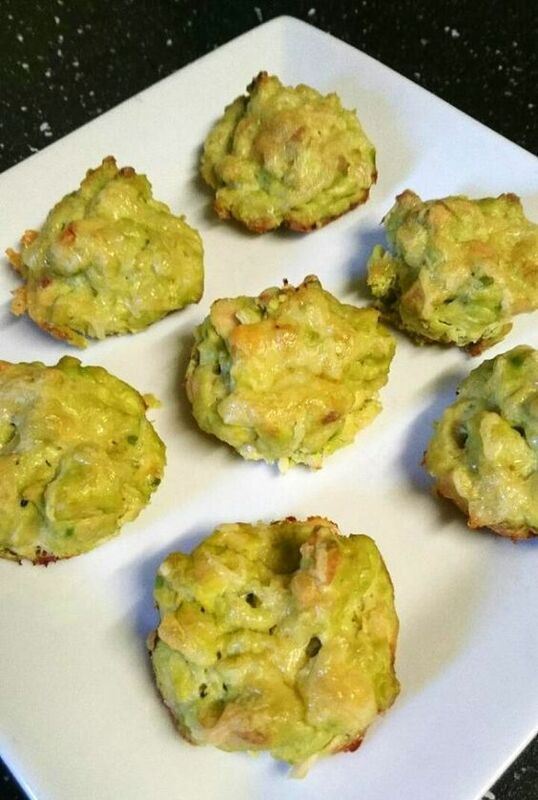 Preheat your oven to roughly 200 C. Mix your avocado, chicken, and eggs until fully incorporated. Transfer spoonfuls of the mixture to your muffin tray. Bake for about 20 minutes, and that’s it. This is one of my favorite finger foods to prepare for my little girl, and the best part about it is that you can serve it hot or cold. Sauté some olive oil in a pan while you peel, grate and squeeze the juice from your apple. Cook your chicken, and then mix it with your grated apples, onion, stock, breadcrumbs, and herbs. Roughly chop the mixture in a food processor then roll a few balls in flour and lightly fry the balls until golden brown. Baking the meatballs is also an option too. 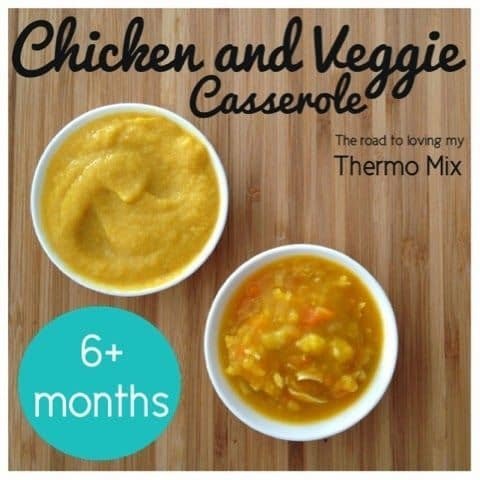 I find this is a perfect first chicken meal to give your baby, as it is intended for age 6 months and older. The taste is a bit strong, so I like to tone down the flavors for my princess. Add your leek to a bowl and blitz for 5 seconds in a thermomixer. Drizzle some olive oil and cook for a few minutes. Add your veggies and blitz some more. Add your chicken breast, water, and stock, and cook for 20 minutes before serving. 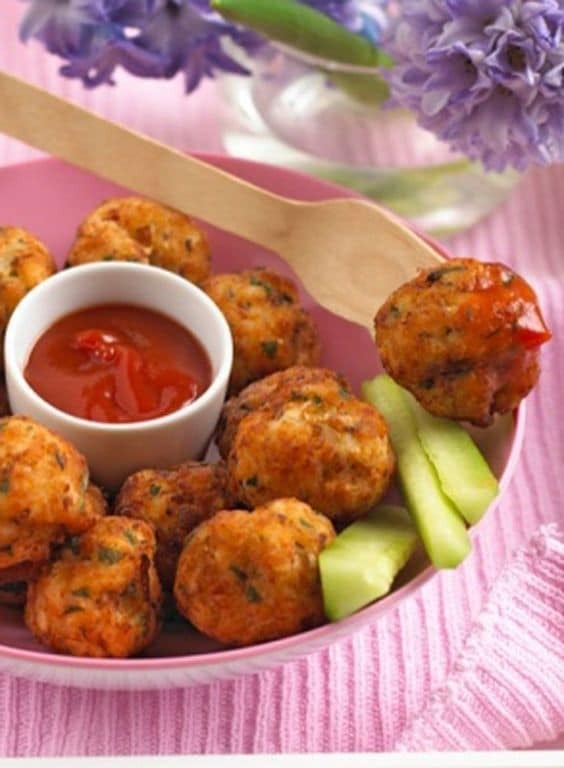 Another great meatball recipe that’s easy for little fingers to pick up. I love this recipe since it uses easy to find ingredients and it is relatively simple to prepare, especially if you don’t have a lot of time. Preheat your oven to 200 C. Prick your sweet potato all over and microwave for 8 minutes. Grind your chicken and breading—separately – and mix together in a bowl. Add the egg or applesauce, mix, and roll a few meatballs. Bake for 20 minutes. My little girl has recently become picky about what she eats. Let’s just say that she’s fallen out with her veggies. Luckily, I found an easy-to-cook meal that has veggies and is a treat for her taste buds. 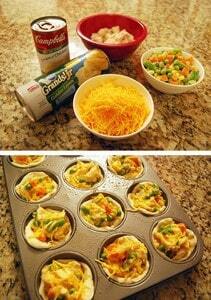 Mix all the ingredients in a bowl and then press the mixture into a tiny muffin tin. Bake for about 15 minutes or until the top turns golden brown. That’s it! 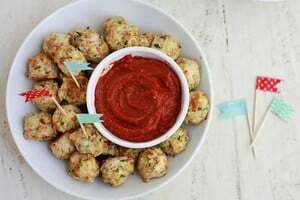 Here is another meatball recipe that your little one will love as well as the rest of the family. I like this particular meatball recipe since you can easily swap out some of the ingredients and use whatever you have on hand. Preheat your oven to 450 F. Start by adding all the ingredients in a large bowl and gently mix them all together. 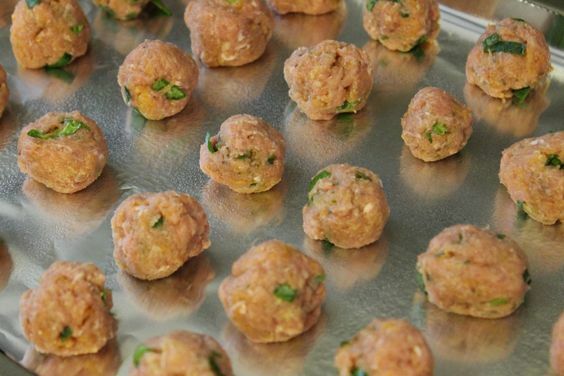 Roll your meatballs and place them on a baking sheet. Bake for about 12 minutes or until browned. 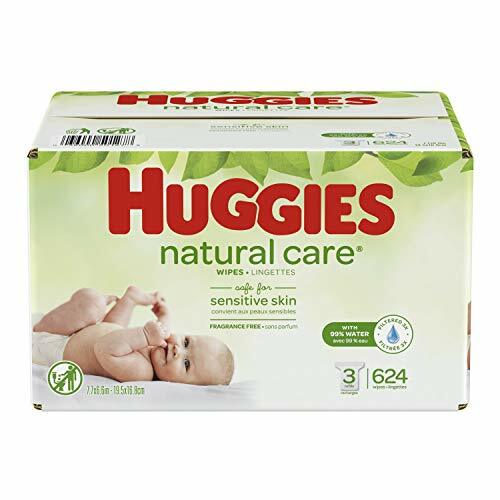 I love these patties and so does my little girl, especially since she can hold them perfectly in her tiny hands thanks to their small size and shape. 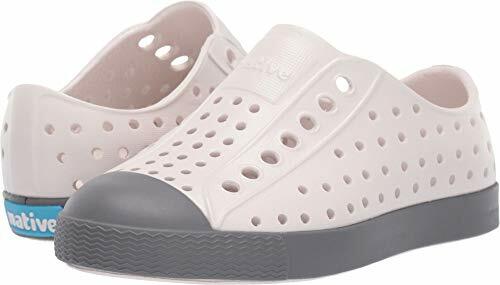 They pair perfectly with ribboned zucchini, yogurt, tomatoes, etc. Mix all ingredients in a large bowl. Using your hands, make small patties from the mixture. Heat a small amount of olive oil in a pan and fry the cakes for about 5 minutes (until cooked all the way through). From my own experience raising three kids, I know that a lot of them are choosy about texture. ​As a result, I included this particular recipe. 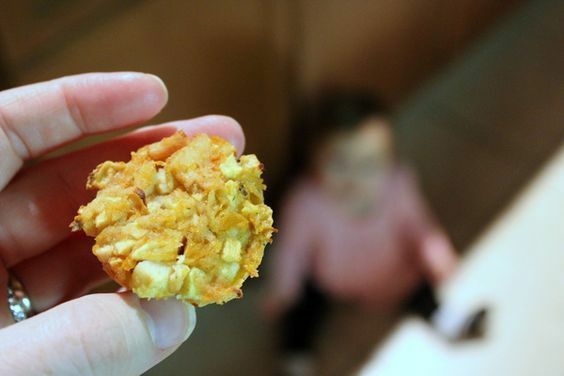 It’s as close as you can gets to a nugget in taste and is super soft, juicy, and tasty. 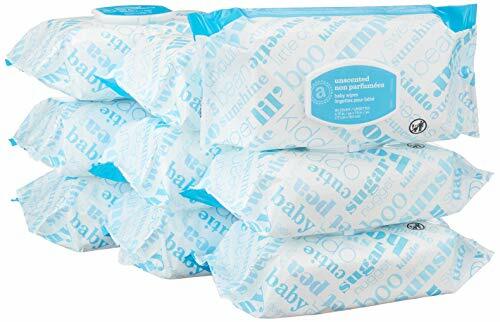 Your bub is sure to love them. Wash and prepare your vegetables, and mix all the ingredients in a large bowl. Heat some olive oil in a pan and add a tablespoon of butter for each patty. Cook until the patties turn brown. Serve with chives or sour cream. Kids have the tendency to choose sweet over savory, but we don’t want to pump them full of sugar to satisfy that craving. 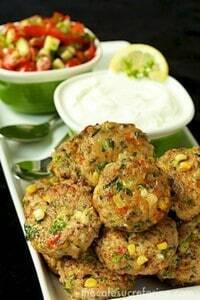 Instead, you can try to add some sweetness to their chicken patties with corn. Mix chicken, corn, water chestnuts, French beans, and onion in a bowl and combine well. Add breadcrumbs and corn flour, and mix again. Add egg, seasoning, and oil, and mix once more. Heat a bit of oil in a non-stick pan. 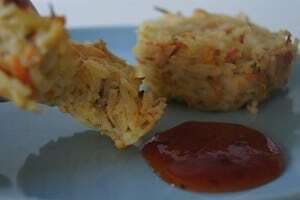 Drop the mixture into the pan by the tablespoon and slightly flatten to create a patty. Cook for 2-3 minutes on each side until golden. Few things go together better than chicken and Parmesan cheese. 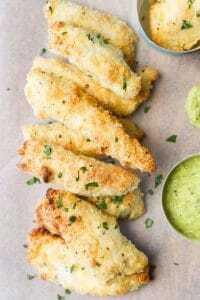 It adds a nice crispy and flavorful layer to these chicken strips, eliminating the need for grains or breadcrumbs. 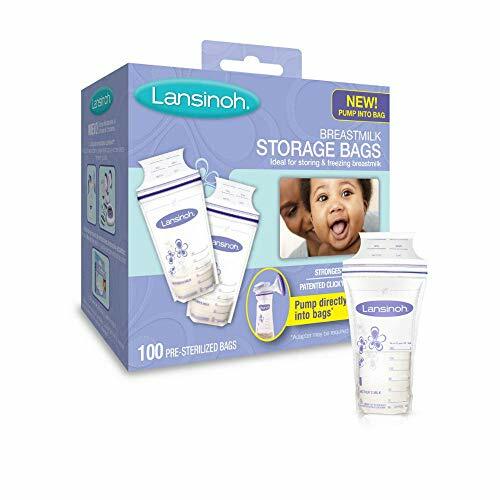 Your little one is sure to love them. Preheat your oven to 200 C. Mix the Parmesan and almonds in a shallow bowl and set aside. Dip the chicken strips into a beaten egg and roll them in the Parmesan mixture to evenly coat them. Transfer to a baking sheet and lightly spray with oil. Bake for 15-18 minutes (depending on the size of the strips). ​I have never really been one who likes to mix fruit with their savory dishes, but mango is an exception. It adds a bit of tang and exotic flavor to just about any dish. The best part about these baked mango chicken bites is that they are allergen-free. No dairy, no soy, no gluten, no eggs, and no nuts. They are safe and fun for just about anyone to eat. Preheat your oven to 180 C. Soak half of the oats in the coconut milk for about 10 minutes. In the meantime, blitz the carrot and onion in a food processor. Add mango, soaked oats, turmeric, and chicken and pulse until smooth. Add the other half of the oats and pulse again. 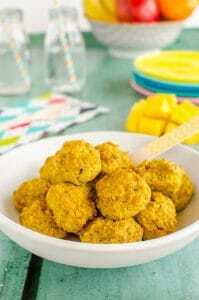 Spray a muffin pan with oil and roll mixture into meatballs, placing them in the muffin tray. Bake for about 20 minutes. No more fussing over a full plate of food. 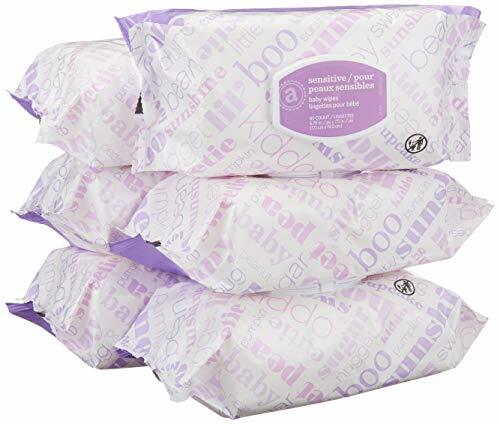 These patties combine your little one’s chicken, rice, and vegetables into one small bite-sized snack. Preheat the oven to 200 C. Heat oil in a frying pan and brown the chicken. Once chicken is cooked through, remove from the pan and shred. Beat the eggs, combine all ingredients in a bowl, and mix. Lightly spray a muffin pan with cooking oil and spoon the mixture into the pan. Top with cheese and bake for 15 minutes until golden. 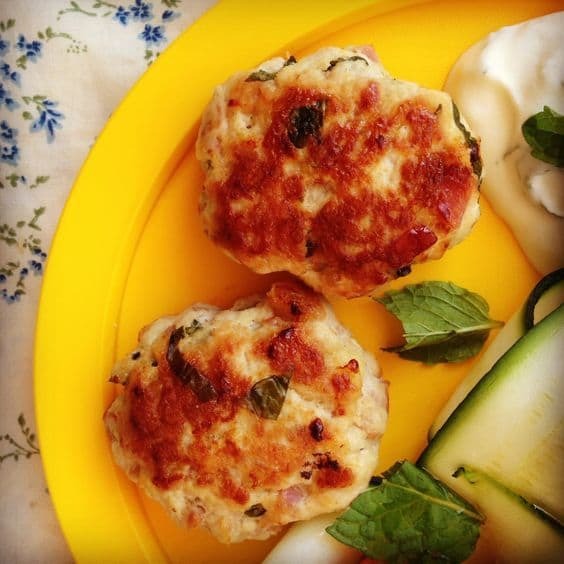 This lovely, light, and fresh burger presents itself with a bit of Mediterranean flair, packing in flavors that the whole family is sure to enjoy. 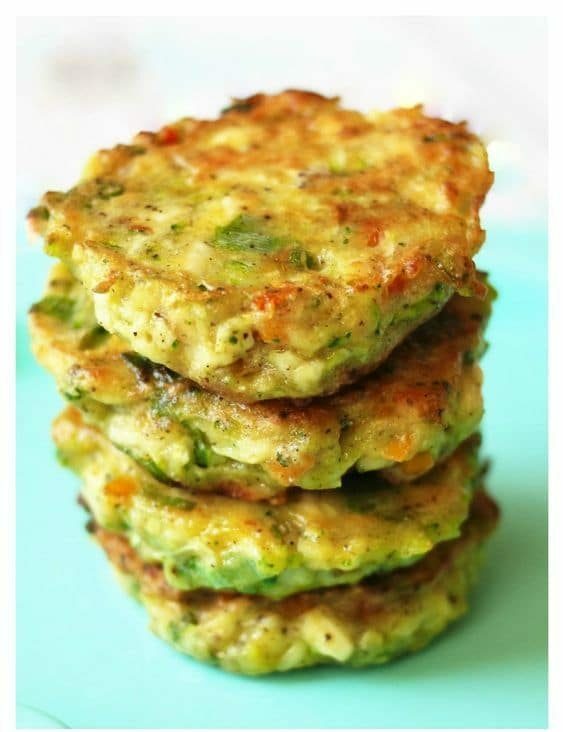 They can be eaten plain, with optional dipping sauces (found on the original website), or eaten as a regular burger on a bun. There are so many fun ways to enjoy this deliciousness. Preheat the oven to 425 F. Start by chopping and dicing the vegetables. In a large bowl, combine all ingredients and shape the burgers. Heat a small amount of oil in a frying pan and sear the burgers for about 2 minutes on each side. Transfer the burgers to a baking sheet and cook in the oven for 7-10 minutes until cooked through. I LOVE pesto. There’s something so classy and refreshing about basil and pine nuts. 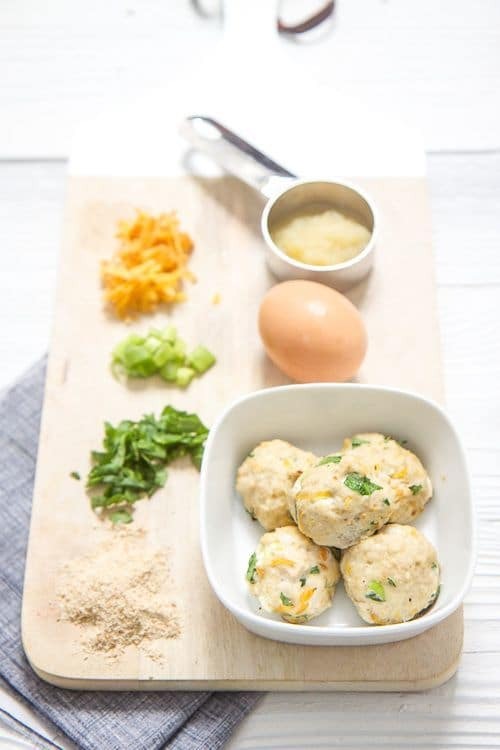 These meatballs are guaranteed to be a hit with the whole family…not to mention super healthy with the amount of veggies inside. Preheat the oven to 375 F. Grate the zucchini and pat dry to reduce excess moisture. Combine in a bowl with the finely minced carrot and bell pepper. Add breadcrumbs, salt, and pesto and stir. Fold in ground chicken, working it with your hands. Drizzle oil on a baking sheet, and line it with meatballs. Bake for about 10 minutes until cooked through. For a baby, feeding yourself sometimes means getting messy, but that’s half the fun. 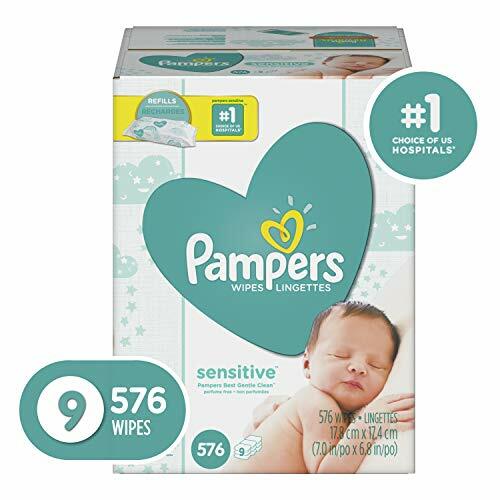 Who doesn’t enjoy seeing their little one’s face covered in a meal they enjoyed? These pot pie cupcake are still a great finger food, but your little one is bound to end up with a little bit of it on their…everywhere! Preheat the oven to 400 F. Combine all ingredients into one bowl. Lightly grease a muffin pan and line it with the premade biscuit dough. Spoon in the chicken mixture, dividing it evenly amongst the cups. Bake for about 12-15 minutes until the biscuits are golden. Combine seasoning, chicken, and lime juice, being sure to coat the chicken. Transfer to a heated and oiled pan and cook for a few minutes before adding the onion. After a couple more minutes, add the peppers. Once the chicken is cooked through, remove the mixture from the pan and set aside. Oil pan again, lay down a tortilla, add cheese and chicken mixture, and top with another tortilla. Cook each side for about two minutes. Cut into quarters and serve with smashed avocado. If my baby girl could pick a favorite food, she would probably say it was cheese. Cheese in itself isn’t bad; it can be a great source of calcium, protein, and healthy fats if you choose the right kind. However, I wouldn’t say that feeding your child mozzarella sticks every day is necessarily a good idea. 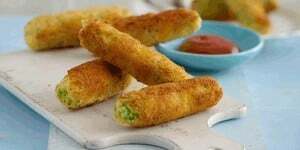 As a great alternative, these sticks have chicken, broccoli, and potato, as well as a bit of Parmesan for a nice cheesy flavor. Steam the broccoli for 5-6 minutes until tender, allow to cool, and finely chop. Mix together the chicken, mashed potatoes, broccoli, onions, cheese, half the breadcrumbs, and half the egg. Separate and shape the mixture into 8 sausage-shaped parts. Coat each with the remaining egg and roll in breadcrumbs. Freeze for about 30 minutes then fry in an oiled pan. As an alternative, you can bake them as well. And there you have it: a list of 20 baby-led weaning recipes featuring chicken for your little bundle of joy. 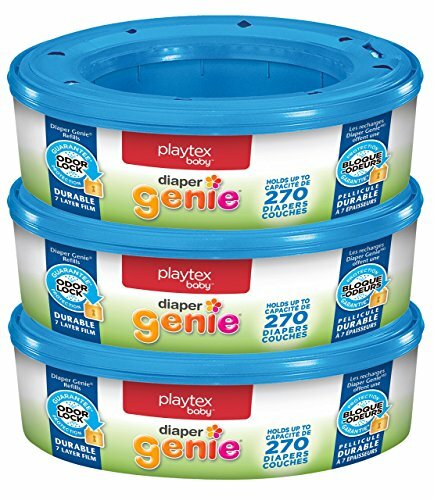 The purpose of this list is to help the growing majority of parents who are moving from the conventional weaning (with the use of purees) to finger foods, and most of us have no idea which chicken recipes are suitable. Albeit baby-led weaning takes a little more work than the conventional weaning techniques, it does give you a front seat to watch your baby’s development, which is fun in its own way. Did you enjoy our list? Is there a recipe we left out? Be sure to let us know in the comments below. 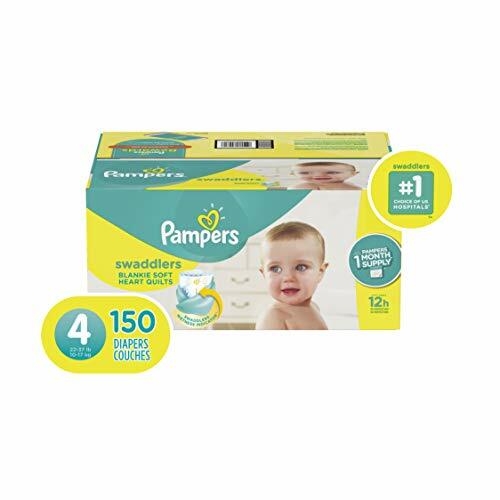 Don’t be shy; we’d love it if you share it with your friends and babies. 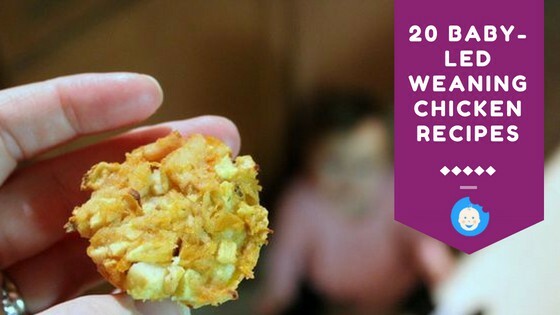 More and more families are switching to baby-led weaning, so we decided to list 20 baby-led weaning chicken recipes that are easy for busy parents.